Harrogate based, locally sourced produce within the heart of Yorkshire. The Yorkshire Farmers Meat Company has become a well-known high quality butchers in the heart of Yorkshire. Almost all the products you find in our shop have been sourced locally or produced within Yorkshire. 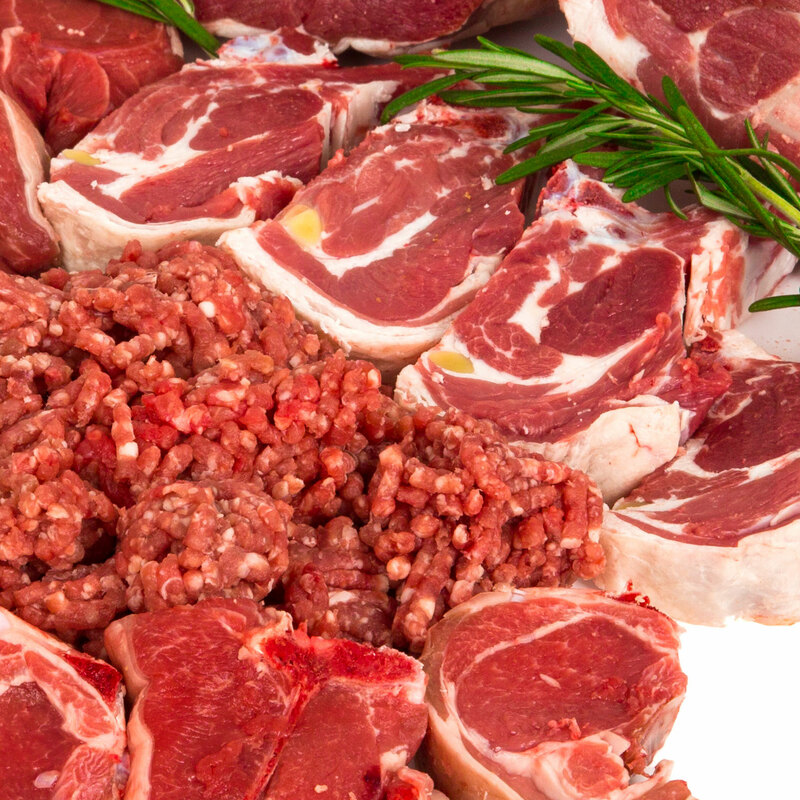 We have the highest quality beef, pork, lamb, chicken, goat and game. All meat is expertly broken down by our experienced butchers ready for you to buy straight out of the counter. Our beef is matured for at least 28 days to ensure it is tender and flavoursome. From fillet steaks to whole ribs of beef and everything in between we aim to give our customers quality and taste. 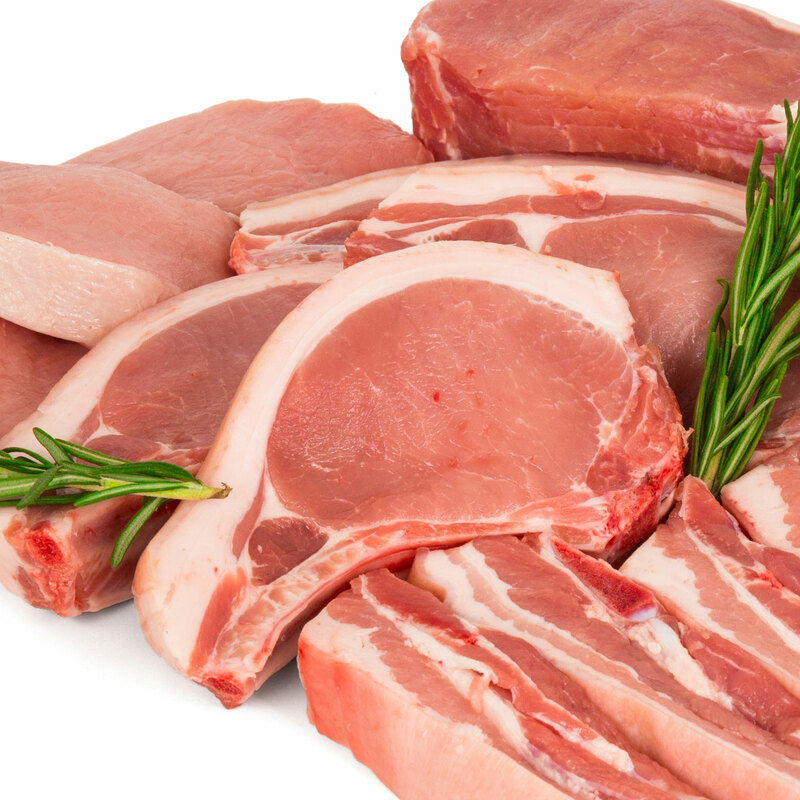 Our outdoor reared free range pork will be different from any pork you will have had before. With a thicker layer of fat this produces more succulent tasty meat. Get one of our trained staff to score the skin for extra crispy crackling too. What could be better than a free range pulled pork sandwich and Hawkshead Bramley apple sauce?! Bacon is essential for that Saturday morning breakfast, soft white thickly sliced bread, proper butter and Yorkshire Farmers dry cured unsmoked bacon. It’s the perfect start to a weekend. Our bacon is all dry cured to make sure that there is no excess water or shrinkage when cooking. What you see is what you get! Sausages are made onsite in our preparation area downstairs. 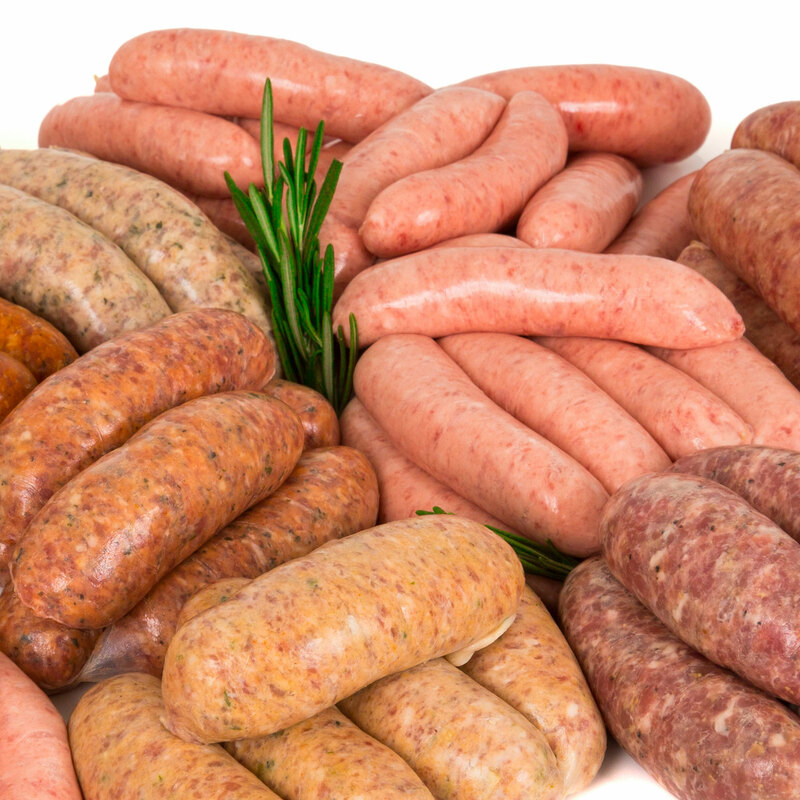 With a meat content of at least 80% our sausages are tasty, flavoursome and quality. We have numerous flavours to choose from, from Spicy leek pork sausages to Moroccan goat sausages, there is a flavour for everyone. All the lambs we butcher are locally sourced along with our goats, just 4 miles away. 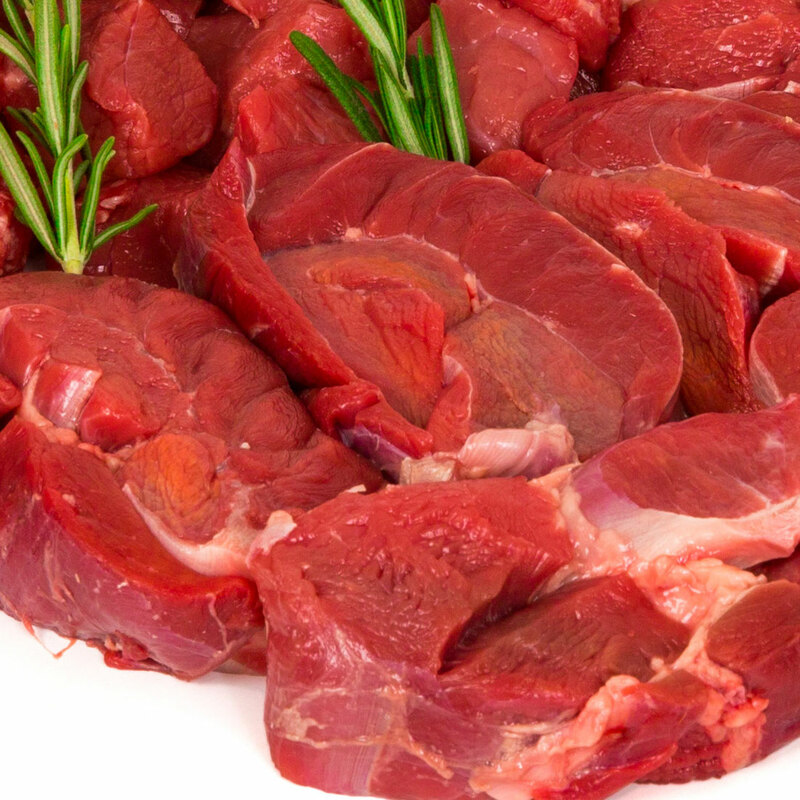 Perfect for curries or Sunday roasts, we produce diced meat for stewing or whole legs for roasting and everything in the middle. Ask one of our staff the best way to cook if you are unsure and your dinner guests will not be disappointed. 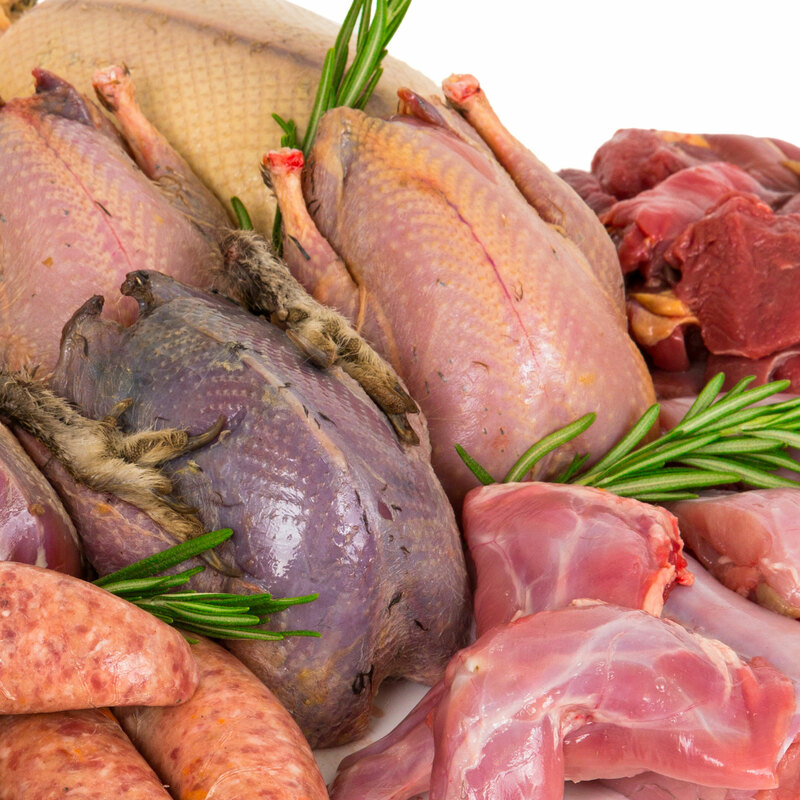 The game we stock is all shot on local shoots and the stock of game at Yorkshire Farmers is seasonal to ensure we provide you with the best quality, fresh game meat possible. Come and try something different, from pheasants and grouse to wild venison and guinea fowl, there is an option for all game lovers. What do you need with top quality meat? A top quality condiment too, and we wouldn’t want to let you down. Come in store to find a vast array of chutneys, jams and preserves. 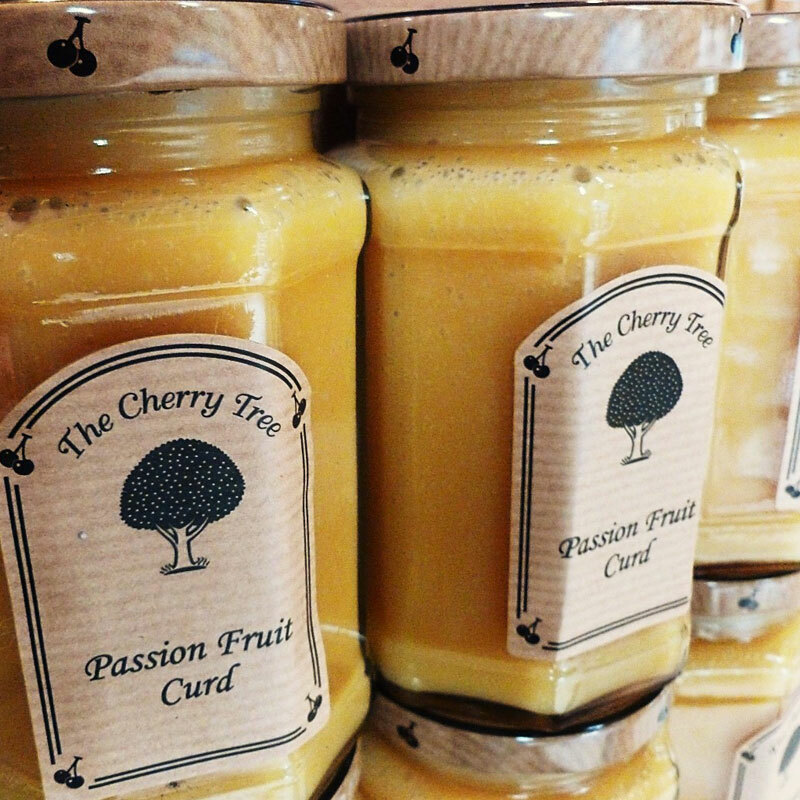 From Cherry Tree Hot Garlic Pickle or Passionfruit Curd to Hawkshead Relish Chilli Jam or Cumberland Sauce, there is one perfect for any dish. At Yorkshire Farmers we stock Gold Standard Multi-award winning pies and pasties that are delivered fresh every morning for you to enjoy as a snack or as a quick and easy evening meal. 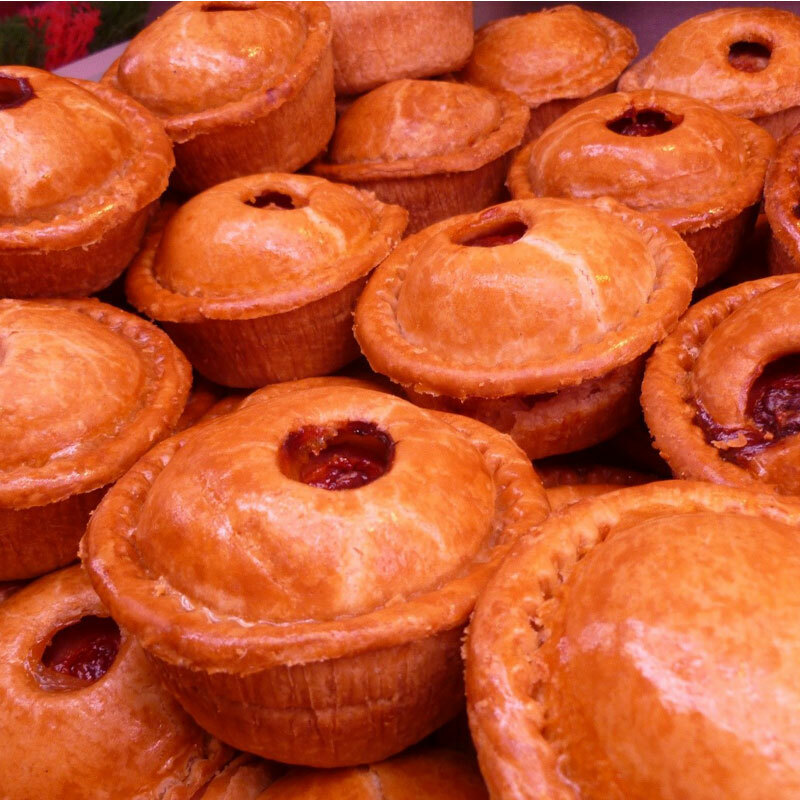 We have various sizes of pork pies, from individual sizes to family sized, sausage rolls, quiches and steak pies. All are fresh, tasty and delicious! 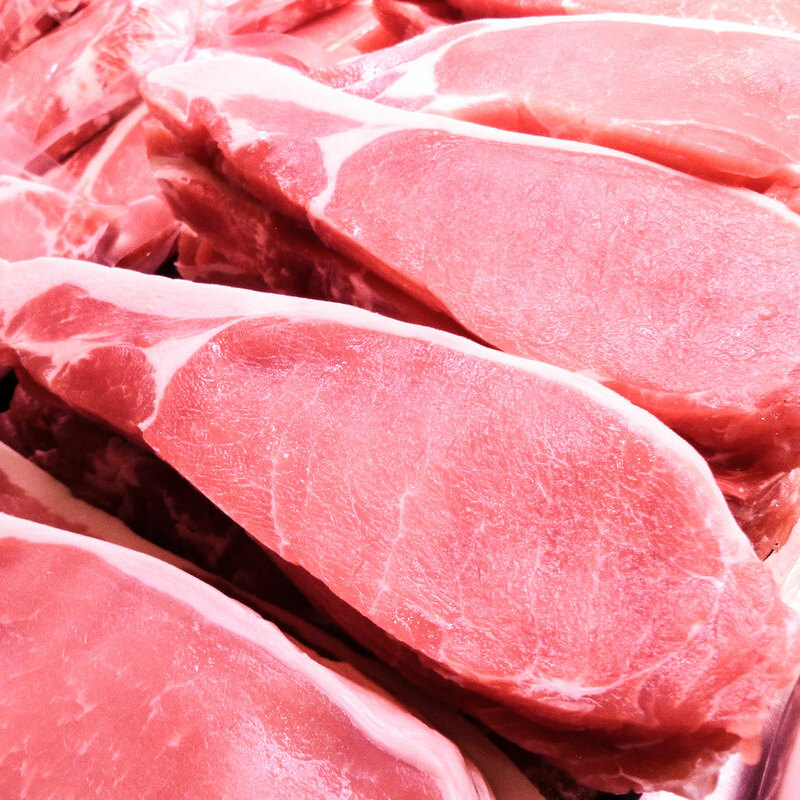 We also provide cooked ham, beef, turkey and chopped pork. All are cooked on the premises to perfection to make sure you get the perfect meat for that lunchtime sandwich. For anyone who is in a rush or not in the mood for cooking, our readymade meals are simple, easy and quick. We have a range of different stir fries including Spicy chicken and Teriyaki beef that can be thrown straight into your wok, no cooking oil required. We also have various chicken cushions from sundried tomato and mozzarella, a classic garlic butter chicken cushion and a goat’s cheese option. Other easy meals are our chicken and duck breasts in sauces. These are packed in oven proof packaging ready to go straight in, no messing about. 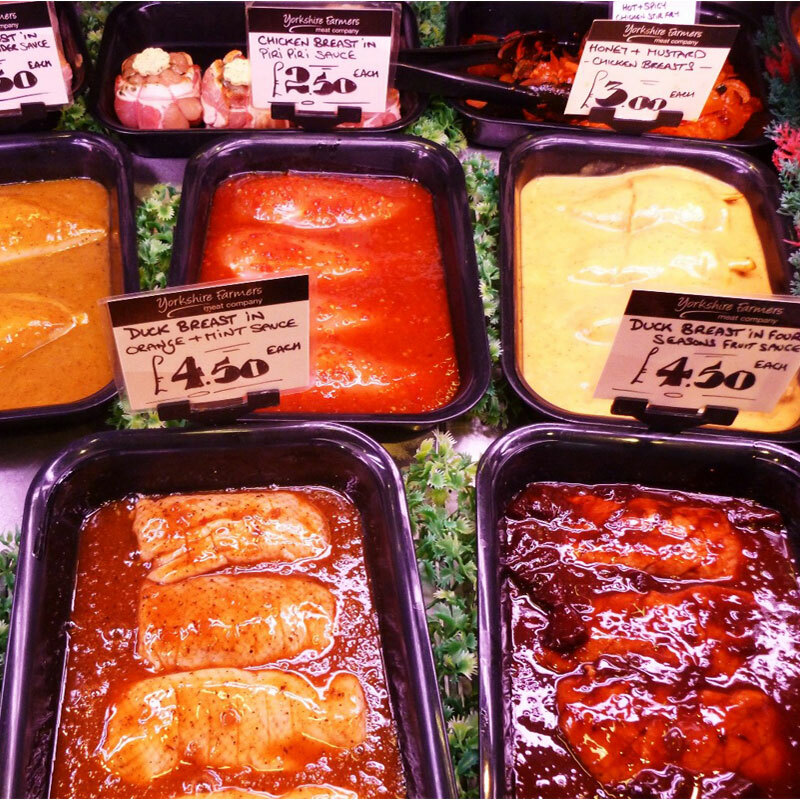 Try our personal favourites of honey and mustard chicken or duck in plum. We see gluten free products as a very important part of our stock list because more people are becoming aware of eating gluten free, whether through medical or health reasons. We stock gluten free pies, gluten free sausages, and a large choice of gluten free cooking sauces. Ask in store for details of any other allergies or eating requirements and we will do our best to accommodate your request.